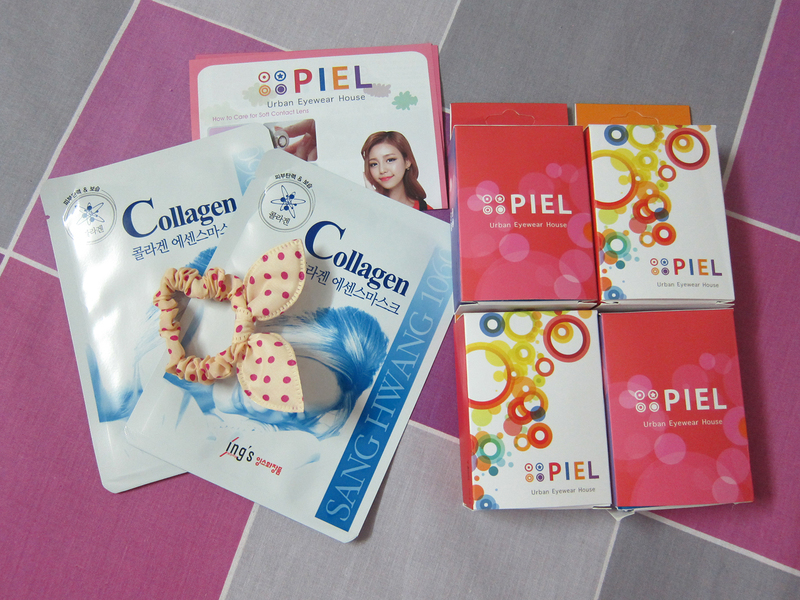 OKDGG.com(One stop online shopping site for everything Korean) has kindly sponsored me with another haul and this time is contact lens haul from COCOPIEL! 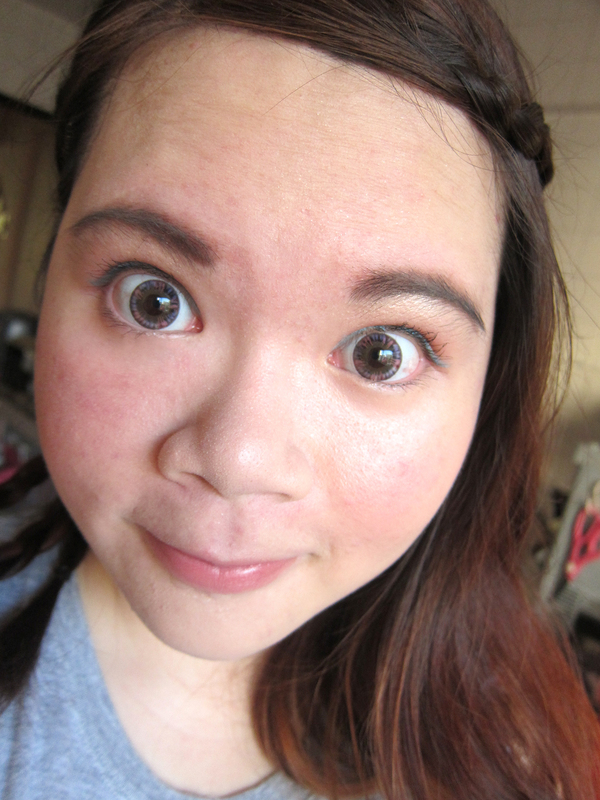 I am someone that could hardly live without contact lens and was pleasantly surprised when introduced to CoCoPiel as they have a huge variety of lenses for me to choose from. It is so hard to find trust-able online retailer for lenses nowadays so I’m glad to know about CoCoPiel. The lenses are well packed into individual boxes that comes with a lens case. This is what all retailers, be it online or physical stores should provide. The local stores always just give me one lens case when I purchased 4 pairs of lenses. The lenses on CoCoPiel are categorized by colors so it’s pretty easy to browse through the huge variety they have. They also have Toric and Hydrogel lenses available. They also have crazy lenses that are suitable for Cosplay! Do note that the prices stated are for zero degree lenses only. You have to add USD6 for a pair of lens with power. 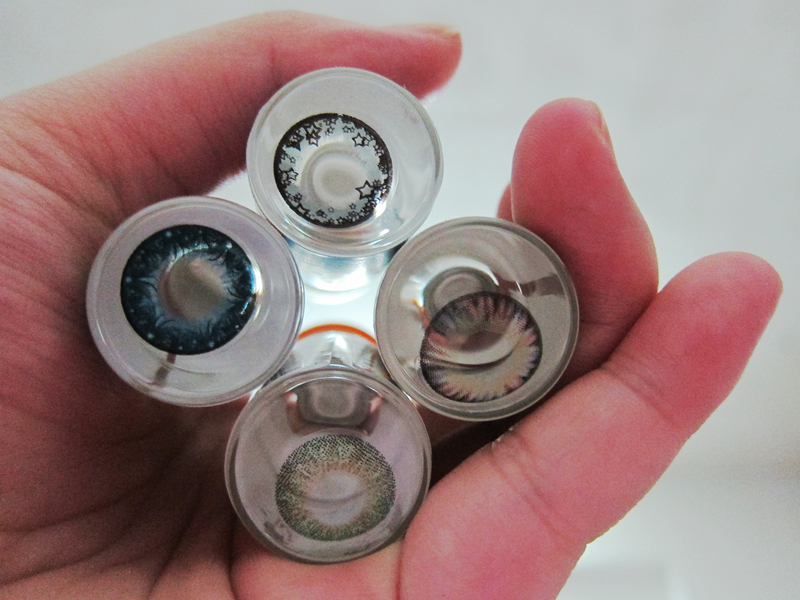 I got a pair of blue, grey, green and violet lens respectively. 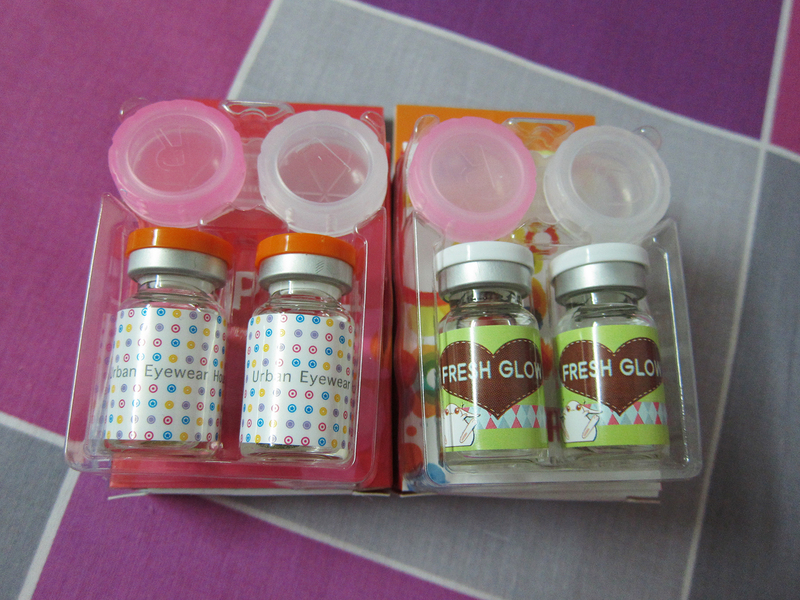 Here’s a close up of the lenses in their bottles. I love the grey pair with the star design, it’s call Cutie Grey if I’m not wrong! It’s available in brown too! These lenses can be used up to 6 months to a year. But I’ll probably just wear them for 3 months max. Be sure to soak them with new solution for at least 4 hours after removing them from the glass bottles! 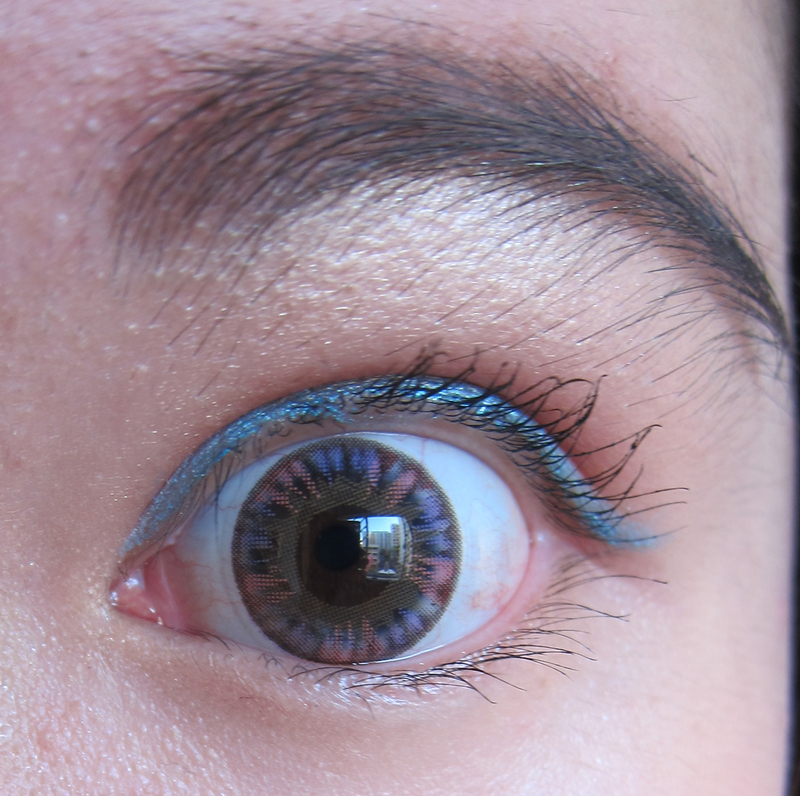 Here’s a close up of my eye, wearing the Fresh Glow Violet pair. I like how it brighten up my eyes and looked natural despite the bright colors. The diameter of the lens is 14.2 mm which I think is just nice. I’ve tried lenses with bigger diameter but those are slightly too over the top for my preference. Here’s a selfie to show the overall effect. I like the dolly effect the lens produced. I’ve worn the lenses out several times for over 10 hours each time and so far they have been very comfortable! But for those who have dry eyes like me, remember to bring a long eye drops to replenish moisture to your eyes throughout the day! Check out this Contact Lens 101 post I’ve written previously! I received an email from Sehee about two weeks ago requesting a meet up. She’s one of the ambassadors of Etude House Korea and was in Singapore for the Etude Pink Play Concert. During her stay here, she was looking for a beauty blogger in Singapore to have a short interview with about Singapore beauty scene. And I’m glad to be able to help her with this project of hers. It’s was really fun to meet up with them lovely ladies from Korean. We kind of hit it off as we are all of the same age despite the language barrier. I must say that Korean girls are really very pretty and sweet!! They are also super kind and generous. Look what they gave me in return for helping them!! Too sweet already!! Though I don’t know how to read Korean, but her photos are very clear and detailed! I love how Beauty knows no boundaries and brings people from different places together! Beauty is like a language of its own and that’s why I love it!